I am sure that you have seen the signs for We Buy Ugly Houses, or the other commercials on the radio. Well, WE BUY HOUSES in Any Condition, AS-IS, not just the ugly ones, and Pay You Cash. Are you relocating because of work? Are you facing a foreclosure or issues with probate? Maybe your family is facing a medical issue or a divorce. You have enough to deal with and that is where we can help. Regardless of the reason that you need to sell your home fast; we can assist you even if there is little or no equity and very possibly give you your full asking amount and Provide YOU with Positive Monthly Cash Flow! We also offer creative financing options. Maybe you don’t want cash. 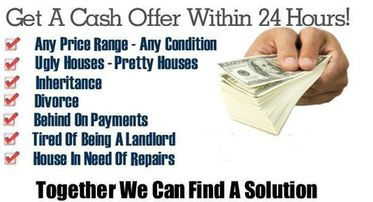 Are you open to take payments and earn positive cashflow? We are open to negotiate terms or simply take over your mortgage. You work direct with us to help you out of the challenge you are facing. Because we are investors rather than real estate agents, we can act faster and offer more creative solutions where everyone wins and can walk away happy. You won’t have to clean, paint or fix a thing. Don’t waste any more or your time or money on those costly upgrades and wait months to sell your home with a realtor. We are making acquisitions across Maricopa County. We have the ability to act quickly and close transactions without cumbersome contingencies. It doesn’t hurt to make a 5 minute call. After that, you can determine if it makes sense to keep talking.